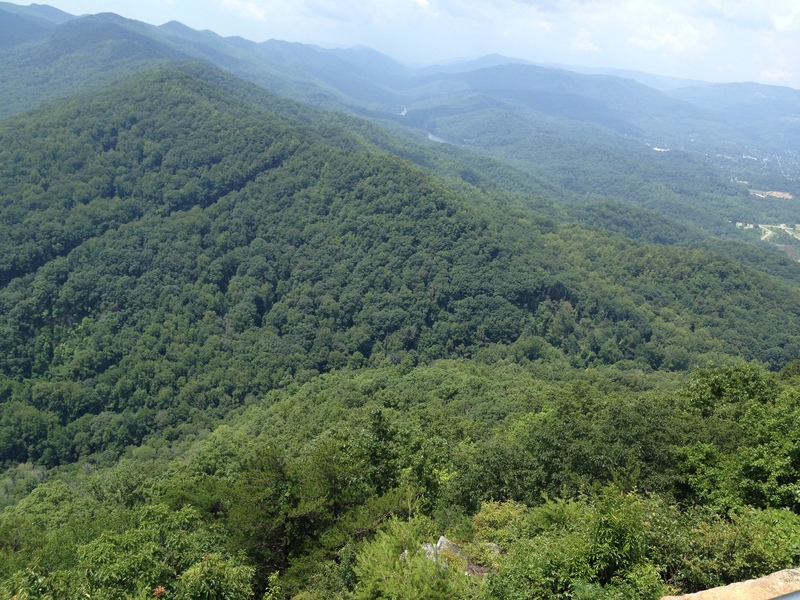 ← Summer Reflections — TVA, Blue Ridge Parkway, the Great Smoky Mountains National Park and Pigeon Forge — Whew! I started to post a new Summer Reflections when I discovered I hadn’t posted this last one from our July trip. So here, you go. 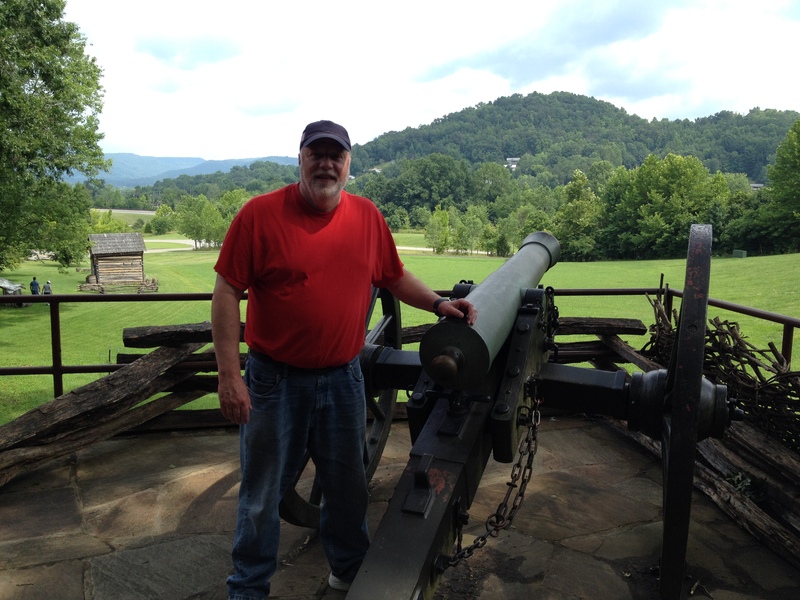 The last of our vacation stops was at Cumberland Gap National Historic Park, in parts of Tennessee, North Carolina, and Virginia. I’d heard of the Cumberland Gap my entire life. I knew stories of the first white people crossing it, and seeing the land of “Kentuckee,” Native for “Land of the Many Bison.” The awe and mystic of crossing through the mountains on the journey westward for trading (Natives) and settlements (White). 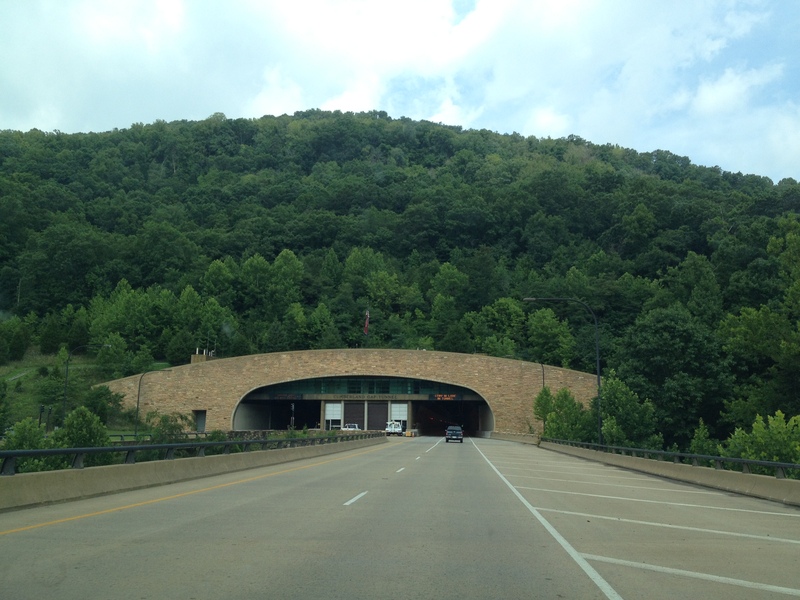 Heading to the park from the south, we passed under the mountain from Tennessee to the south and into Kentucky by riding through the 25E tunnel. Tunnel construction started in 1979 to alleviate traffic in the small towns on either side of the gap, and also prevent accidents along the treacherous road through the gap. The tunnel did run parallel to the gap. We could have halted in Middlesboro, KY, to hike to actual trail, which long ago was a bison path, then an Indian trail, then a path used by white folks’ wagons, horses and pedestrians. Later it turned into a curvy and steep road, once nicknamed Massacre Road because of all the accidents. And after the tunnel, turned back into a trail. 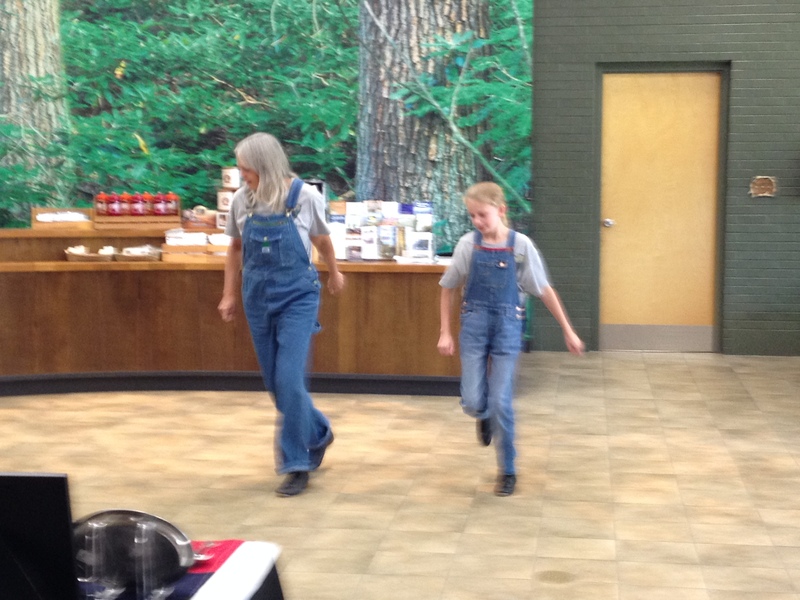 Just past the tunnel, we stopped at the National Park Visitor Center and were able to catch a mother-daughter folk dance team, which was lovely and fun. I bought a pioneer bonnet there which would match my 1860’s outfit I wear for school visits. On the label, it was marked for Gettysburg, PA, and stated it was made in China. So much for purchasing folksy hand-made Americana. One thing which surprised me was it seemed most attention in the park was focused on the period of the Civil War. Being border towns during the Civil War, they were both pro-Union, but the location changed hands several times during this period. 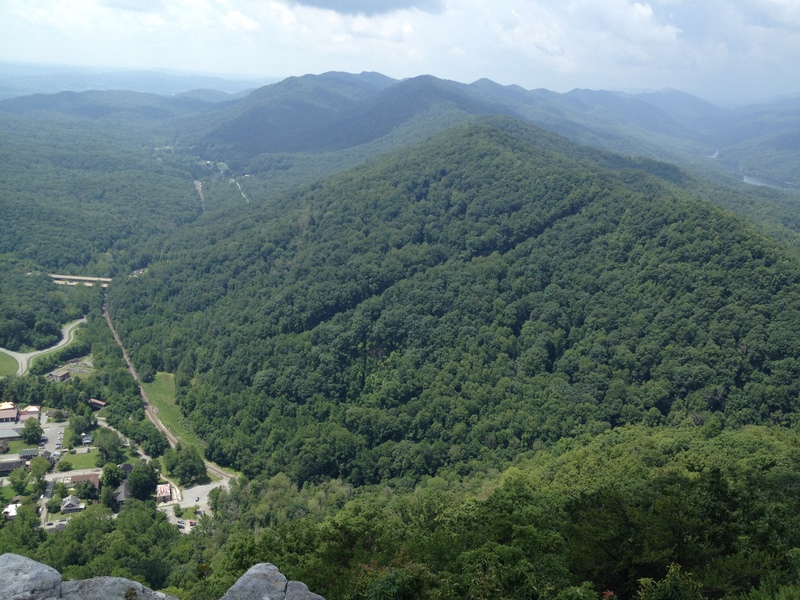 Here are views from Pinnacle Overlook, above the saddle of Cumberland Gap. We stood there for a long time with four women from a sports team. They came from between the Smoky Mountains and Cumberland Gap, and were familiar with the area, and the briars and the poisonous snakes. 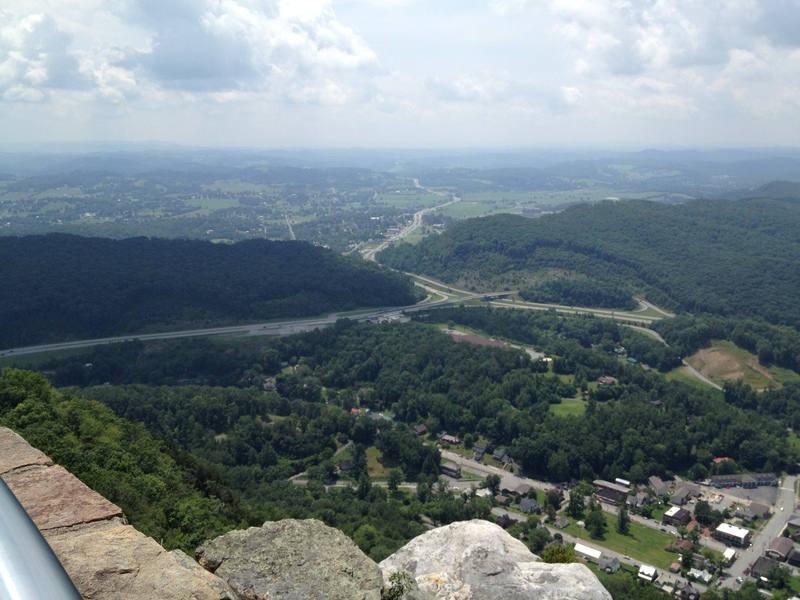 In the first view, there is the small town of Cumberland Gap, TN, with 25E starting into the mountain. The middle picture shows the saddle of the Gap. The third photo shows the town of Middlesboro, KY, and 25E continuing to wind its way west and north. 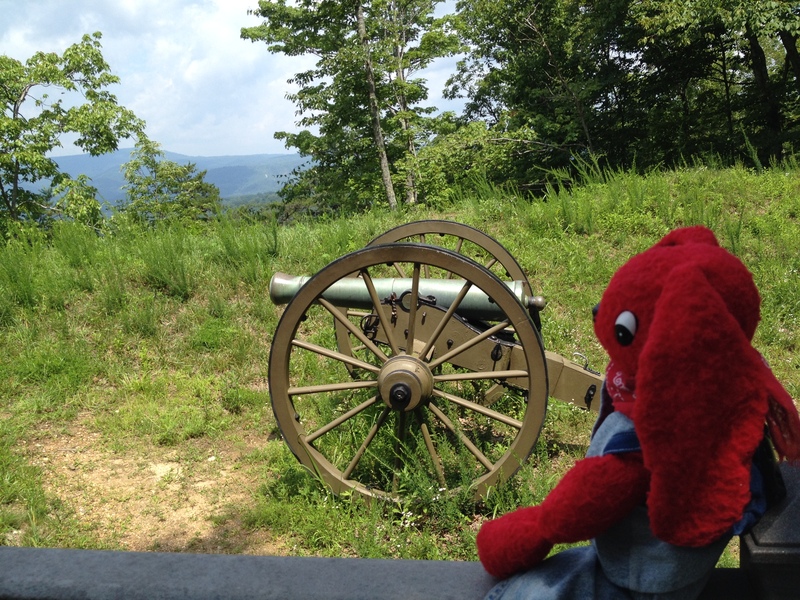 I would have liked to have spent more time exploring and thinking about Cumberland Gap National Historic Park, but on the day we visited, it was very hot, very mosquito-y, and it was the last sight on a week-long adventure before bee-lining it home to Michigan. This entry was tagged Civil War, Cumberland National Park, Frountier, snakes. Bookmark the permalink.